Julie Lerman is recognized as the foremost expert outside of Microsoft on Microsoft's ADO.NET Entity Framework. Julie is available to mentor your company whether you are trying to choose a data access platform or are ready to implement Entity Framework into your architecture. "... extract real value from the EF now. " Programming Entity Framework is one of the best technical books I've seen in quite a long time. Julie has done an amazingly comprehensive job covering all aspects of using the ADO.NET Entity Framework. This is sure to become the canonical reference book on the subject. I’ve just posted the solution for Chapter 27, Building Layered Web Applications on the Downloads page of this site. I’ve just posted the solution for Chapter 24, Building Persistence Ignorant, Testable Applications on the Downloads page of this site. 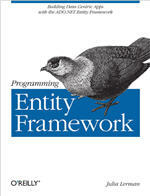 Programming Entity Framework e-book for $9.99 today only!